The Master3DGage™ portable CMM system uses Verisurf’s precise, 3D model-based software to quickly and accurately verify part quality—right on a CNC machine or anywhere else in the manufacturing process. In-House Solutions offers you the best tools in the industry for Automated Inspection, Quality Reporting and Reverse Engineering. 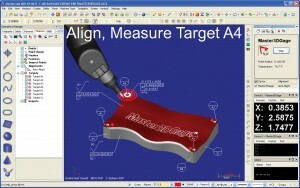 Align: Verisurf quickly aligns your part to your CAD model by creating targets on the CAD model and guiding you through auto alignment by probing each target on the part. Inspect: Verisurf displays real time part to CAD model deviation when probing the part surface and guides you through automated inspection plans. Real time visual and audible indicators combined with color deviation displays provide you with instant part quality feedback. Report: Verisurf uses the 3D CAD model as the inspection nominal which quickly generates custom reports in industry standard formats with GD&T constraints, color deviation maps and in or out of tolerance indicators for clear, practical analysis. Measure: Veris urf can directly measure 3D features including planes, cylinders, cones and spheres and 2D features including lines, splines, circles and slots. In continuous point mode Verisurf can measure 100 points per second with long probes capable of reaching inside deep cavities to quickly scan 3D point clouds of complex surfaces. Mesh: Verisurf’s powerful point cloud and STL mesh editing tools helps prepare large data sets for 3D mesh surfacing and 3D printing. Verisurf has all the mesh tools you need to create watertight mesh models including; align and merge meshes, filter, smooth and fill holes. Model: Verisurf has all the reverse engineering tools to transform 3D point clouds and meshes into 3D surfaces and solid models for precision manufacturing. Verisurf imports and exports popular CAD formats making it the ultimate interoperability platform for automated inspection, guided assembly and reverse engineering. Let In-House Solutions answer all your PCMM questions! Give us a call today to learn how to set up your shop floor with the tools to save you time and money with Master3DGage powered by Verisurf Software!